Rockers Day with the S.R.B.C. With the year of the Monkey now here, the Chinese year kicked off with the S.R.B.C. Rockers day and boy was that a really cool turn out for that event. Retro Rockers Documentary Trailer from Michael Rush on Vimeo. All Rights Reserved Please ask to use as these are not mine and they all gave me permission to use these great shots. Thanks go out to Michael CW Chiu for all your help, hope you like this? Below is just a few photos to show you what they got up to across the globe and they really have grabbed hold of the Rockers look and style, the 59 Club really has crossed oceans and all the better for it. So sit back and enjoy this great collage of images from a super club in Hong Kong. A great Photo here of how wide spread the Rockers image and of course the infamous 59 Club have come along in 55 years. Some Cool Triumphs turn up as they get ready for their big day and the weather looks perfect for this event. Sporting a copy of the BRMC Black Rebels motorcycle Club, these Skull and crossed bones are a happy group for sure. This is their club and they make many cool rides and meet ups, this is what it is all about and promoting motorcycling too. Cool Belstaff Trail Master jacket here with 2 cool Lewis Leathers Brando style Jackets. Lots of fun by the looks of it and one day hope Jenn and I can venture out to see these lot. Making sure his DA ( Ducks Arse) is bang on! Epic Beeza and the owner looks the part for sure, Ton Up my friend. Such an awesome meet up and they look the part too, I would sure like to go on one of their rides one day a really cool turn out. A little time t check people machines out and get ready for them to take their ride. I love that Rickman style fairing. Love this photo Rockers Max Tam and Coan Kee in Hong Kong. with Coan Kee and Felix Shu. Belting up the tarmac, great shot of the Bikes and riders. 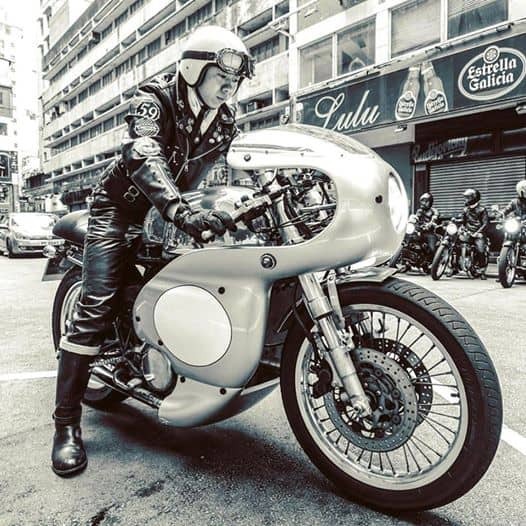 Felix Shu on his BSA! It looks like they are all having fun. Checking out their friends as they have fun on this day. Thumbs up as he blips along on his Bonnie. SR500 belting along with one of my headlamps fitted. Max Tam coming in from the right looking focused. Mike Chau is 2 up and into it. Kith Lee is also running a pillion on this fun day with the S.R.B.C. Max Tam enjoying the ride, love the Lockheed brake. Grey skies like back home in London but it wont stop you when you are having fun. Thumbs up and enjoying the days ride. Even the little Honda CB400 gets in on the action, so much fun. Rocking the DOHC with the lads, great to see out there. Felix looking cool in his Ton Up gear with Coan Lee too. With Barry Tam, Felix Shu and Billy Rocka. With Anita Ng and Ku Hui Ting. Thats a great leather set up right there. A Sport Classic with Custom Zards. kicking it in the guts! This is the Year of the Monkey but also I think, the Year of the Cafe Racer. Love these bikes, the look, the style, they seem to have captured the British style and a great job too. The Roads look pretty well kept too. Allen Lee took these mighty fine shots i believe. Sporting a Norton Manx Tank too. Some really nice Motorcycles turning up for the days events. This is I hope to have mine at some point in time. All parked up in a Hong Kong street. People pulling into the Park Hotel area with their Trumpys etc. Even the Guzzi’s turned out for this day. T100 arrives and gets ready t park up and meet his friends. Camaraderie is something that is earned not purchased. Here is a cool shot for you, nice line up. Have a good chin wag about life in general is always fun. Benelli 3 1/2 love these bikes,. Ducati, Honda, Triumph, Bsa all col to see. This could easily be mistaken for back in London. This is exactly what I would be doing here. What a fantastic shot of Rocker Love below. All Rights Reserved — with Coan Kee. All Rights Reserved — with Rockers Max Tam. GB500 cafe , all Rocked out with a Dunstall Style fairing Kit. All Rights Reserved — with Lai Kit. All Rights Reserved — with Yanmi Lo and Fall AU. All Rights Reserved — with Fall AU. All Rights Reserved — with Coan Kee and Felix Shu. Nice essence of Speed image taken here, great job. All Rights Reserved — with Felix Shu. I really do love this shot, showing what fun this is to be in the style of Motorcycle club and the camaraderie. All Rights Reserved — with Kenji De’. text Mum that you are just going to the movies, dont mention motorcycles. ha ha. All Rights Reserved — with Kenji De’, Coan Keeand Anita Ng. Our 59 Club seems to be over over in China now. All Rights Reserved — with Coan Kee and Kenji De’. All Rights Reserved — with Mike Chau. All Rights Reserved — with Marcus Yuen Tattooer. Fantastic show and love the fairing, hope to have one for my machine at some point. One for the Guzzi Fans. All Rights Reserved — with Freddy Bikes. All Rights Reserved — with Jaxx Yuen and Ken Hui. Awesome shot coming across the bridge. Desmo having its legs stretched. Old with newer and a great Combination, cool skid lids as well. Brilliant shot in the tunnel, just amazed at this capture. DOHC fits right in on this ride, Classic styling. Always something new to learn or fix. All Rights Reserved — with Coan Kee and Rockers Max Tam. Also, Here is a little Video from a couple of years back for you to enjoy. Rockers Day 2014 Hong Kong from Michael Rush on Vimeo. Looks like they know how to have fun and hopefully one day we shall get over there and join in on this celebration. Here are two of the latest Video’s for you to enjoy, thanks for watching and reading and hope you liked it as much as I did. If you like this style of Motorcycle and are in Southern California and want to enjoy rides and gatherings, check us out, we are a fun group and from all backgrounds, check us out and come to a meet if you like. This entry was posted in Blog and tagged 59 club, ace cafe, AJS, bonneville, brat, BSA, busy bee, cafe racer, classic, custom, Ducati, FRANK THOMAS, GASOLINA BOOTS, Goldstar, Honda, HONG KONG, lewis leathers, matchless, norton, rockers, Rocket three, scrambler, SRBC, thruxton, ton up, tracker, triton, triumph, Villiers, yamaha. Some More Music to work by today.